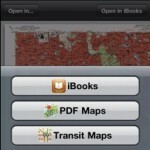 This app gets the job done: PDF Maps introduces a strongly played set of basic features and later versions promise to add more advanced features like layer visibility and feature attribute query. 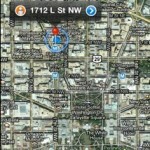 Professional cartographers can use the app to deliver custom cartography maps that leverage GPS to locate the map-reading customer with the magic blue dot. It’s certainly not an ArcPad, but it works on the iPad and you’ll find it fun to use (and the app price is right). 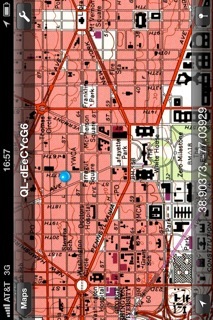 I quite enjoy Avenza’s new free PDF Maps iOS app, free and available now on the iTunes App Store for iPhone and iPad. 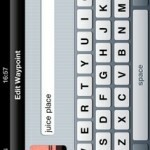 I’ve been testing it for several months using both the beta and final release versions. I’ve used the app in my neighborhood, on a cross country road trip, and we’ve been using it to ground truth maps at at my day job. I’ve created my own GeoPDFs and used those from USGS and Avenza. 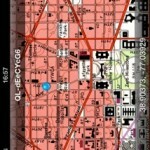 Besides myself, I setup two non-cartographers with an iPad (3g with gps) and several GeoPDFs depicting neighborhood-level street maps to field check in the Washington DC metro area. They were amazed at how easy it was to locate themselves on the map and make notes by dropping markers they bring back to the office for me to review. 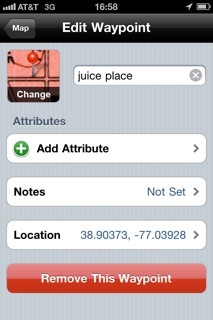 Because these particular maps include street labels, they don’t need to switch back and forth to Apple’s provided Google Maps app as they navigate. The inaugural version is iOS only but the company has had requests for Android, Symbian, Blackberry and even Windows 7 Mobile. Expect an Android version next. Future iterations of the app may introduce a two-tiered, free-basic feature and pay advanced feature parellel versions, which seems reasonable to me. I’m also excited to see if a white-label version becomes available (much like the Flash SWF export out of Avenza’s MaPublisher plugin for Illustrator) that cartographers can use to brand the experience and pre-bundle their maps. Supports both Adobe/ESRI geospatial PDF maps and TerraGo/USGS GeoPDF® files. To create a GeoPDF, you’ll need ArcGIS 9.3.1+ to export from ArcMap with preserve coordinate system checked. Or use Avenza’s MaPublisher plugin for Illustrator (version 8.2+). 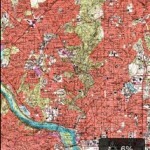 You can also download thousands of GeoPDFs from USGS. Even though the USGS files use the TerraGo GeoPDF format specification (versus Adobe + ESRI’s), it will open and render in PDF Maps.app. Avenza also offers dozens of sample GeoPDFs linked from within the app to get you started (click Maps, then +, then From Avenza PDF Maps Library and browse the list). 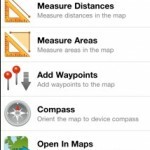 Adding maps is as simple as dragging them to iTunes or attaching to an email (making it easy to send map updates to your field checker). 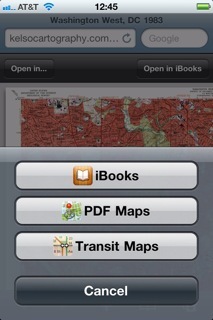 Clicking on a PDF link on the iPhone or iPad now prompts to open in the app, as seen in the first screenshot above . 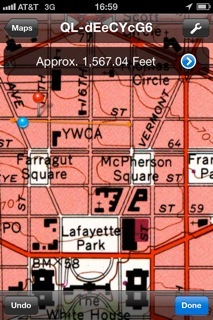 Once opened in the PDF Maps app, it will take a few seconds to minutes to render, second screenshot above. 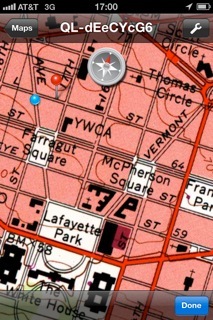 Once open, several tools are available, the most important of which is simply the “locate me” triangle button on the map map view. Even though it’s all about the PDF map you’re looking at, the app makes it convenient to open the same view in Maps.app to see Google’s version of reality for cross checking, especially using the satellite map tiles there. This is possible for both the current map view using the tools menu, and to open a specific waypoint marker after clicking it’s location field. I’ve loaded PDFs with the app that are more than 10 mb of vectors and performance has been good. When the map first loads it will process and prepare several zoom levels of precached tiles. 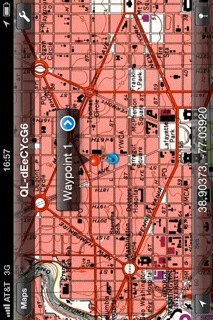 This will make panning and zooming faster during actual map use and is worth the wait. During precache rendering, you can still use the map, but the parts that will still be loading will be fuzzy for a while. Very large maps (larger than 20 mb, or more than 2000 sq. 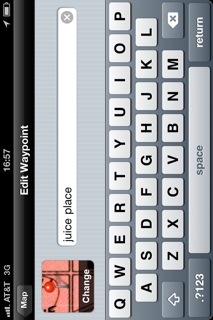 inches) are slower to render in this version (hey, it’s a mobile phone). For larger areas, I’ve been splitting the exported map into separate files. 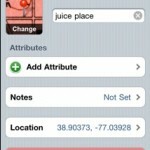 When multiple maps loaded in, there is a Maps table of contents listing. I found a couple continuing quirks with the app and one major missing feature. 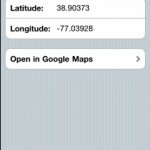 The app really needs to export the map’s waypoints as CSV, KML, and GPX as an email attachment. 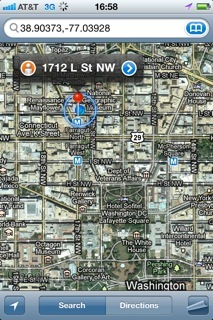 I wish repositioning an existing pin was easier. The hit areas on some buttons is small, making it hard to use in a moving car. Sometimes it’s nice to have multiple marker icon labels open, but sometimes that is odd. At any rate, there’s no way to close them all en mass. Note: Because of USGS website quirks, it is not possible to directly download a USGS GeoPDF onto your iPhone/iPad in the field. The website doesn’t render properly (something about IE and cookies), and the resulting download file is ZIP format rather than PDF. Not sure why, since the PDF should already be optimized for file size (there’s only a 1.5% file size savings between ZIP and PDF in the Washington D.C. West quad sheet). 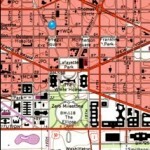 Republished in part from ESRI Forums. 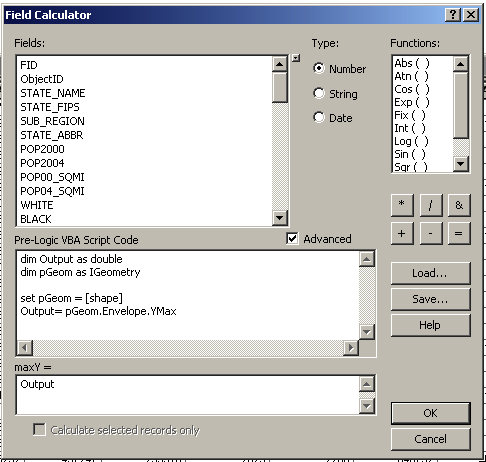 Sample Field Calculator code for computing XMIN appears below. Model” diagram (pdf). All four parameters are Xmin, Xmax, Ymin, and Ymax. 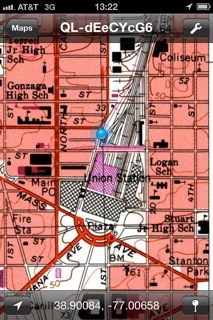 Q: What has ESRI done in the area of map books? A: At ArcGIS 10, functionality has been added to allow you to create map books using a feature layer to define map extents for multiple pages. This new functionality, in conjunction with all the other enhancements to support map books, is referred to as data driven pages. Data driven pages give you the ability to generate multiple pages by taking a single layout and iterating over a set of map extents. Any feature layer, point, line or polygon can be used, along with a margin, to define the extents. 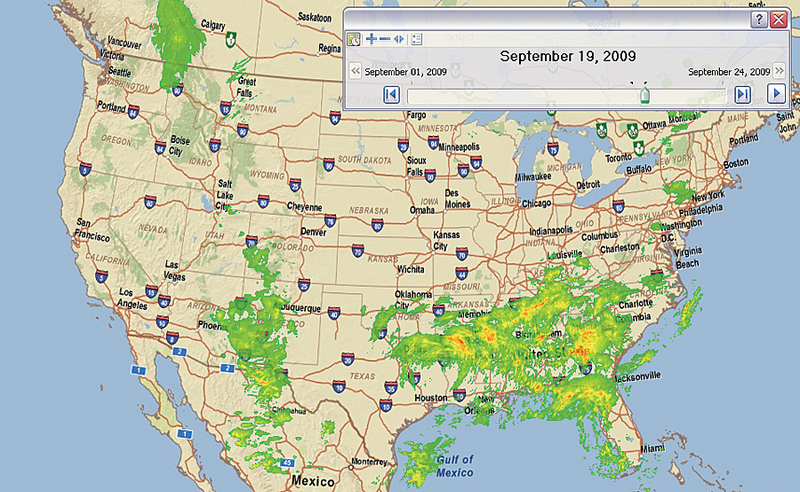 A question I still get asked again and again is when is ESRI going to update DS Mapbook. Well now you’ve got a real solution built into ArcGIS 10. 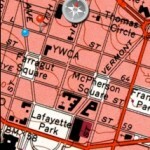 Q: Does ArcGIS 10 open up more functionality for use with Python? A: Python integration is one of the key features of ArcGIS 10. At this release we’ve introduced a new Python subsystem called ArcPy, which exposes many of the ArcGIS functions. 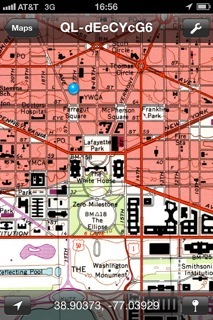 ArcPy is still a little kludgy, but wasn’t isn’t with ArcGIS 10. Continue reading at Spatially Adjusted . 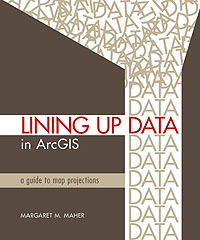 . .
‘Lining Up Data in ArcGIS‘ – a guide to map projections is a new book from ESRI Press. It is authored by Margaret M. Maher. Since I don’t have ArcGIS running in my office I couldn’t try out some of the details provided in the book, nevertheless, I did spend some time running through the book and offer the following comments. One of the issues that many people encounter with GIS data revolves around projections, coordinates and lining up data with already existing spatial information. I’ve made the mistake myself numerous times, excited to get the data into the system, only to open the map window and finding what I just added from Berlin is placed in Oklahoma, Alberta or the middle of the Mediterranean Sea. How did that happen? Because I never lined up the data properly. This book is very helpful. 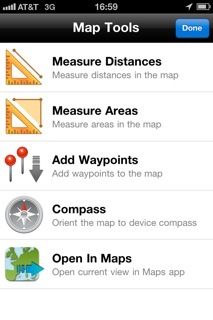 It explains how to identify geographic coordinate systems as compared to projected coordinate systems. If you are using ArcMap, then this book will show exactly how to determinine projections and set them. It even provides examples for going to ArcGIS Online, downloading imagery and aligning it properly. Continue reading at Vector One . . .
Republished from the ESRI ArcUser Winter 2010. The ability to obtain precise information is nothing new. With great patience and skill, mapmakers and land surveyors have long been able to create information with an impressive level of accuracy. However, today the ability to determine and view locations with submeter accuracy is now in the hands of millions of people. Commonly available high-resolution digital terrain and aerial imagery, coupled with GPS-enabled handheld devices, powerful computers, and Web technology, is changing the quality, utility, and expectations of GIS to serve society on a grand scale. 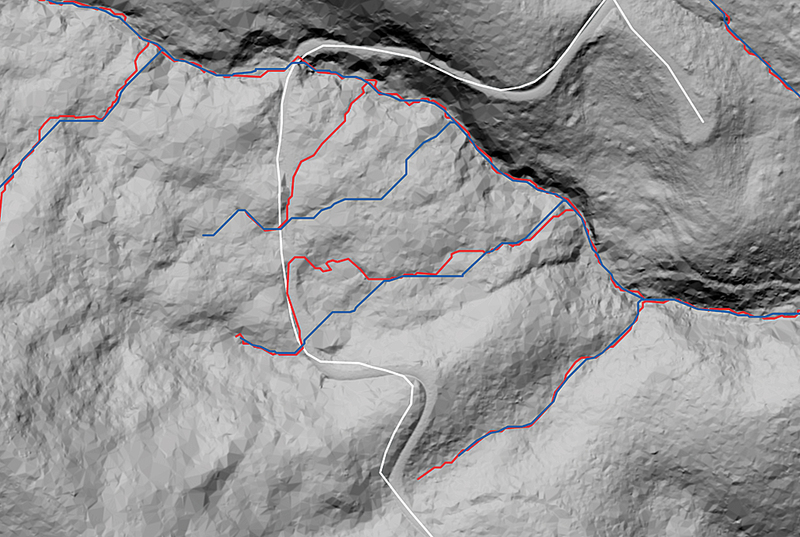 This accuracy and precision revolution has raised the bar for GIS quite high. This pervasive capability will be the driver for the next iteration of GIS and the professionals who operate them. When I say there is a “revolution” going on in GIS, I am referring to the change in the fundamental accuracy and precision kernel of commonly used geographic data brought about by new technologies previously mentioned. For many ArcGIS users, this kernel used to be about 10 meters or 40 feet at a scale of 1:24,000. With today’s technologies (and those in the future), GIS will be using data with 1-meter and submeter accuracy and precision. There are probably GIS departments—in a large city or metro area—where this standard is already in place. However, this level of detail is far from the case in natural resource management agencies such as Bureau of Land Management (BLM) or the United States Forest Service. But as lidar, GPS, and high-resolution imagery begin to proliferate standard sources for “ground” locations, GIS professionals will begin to feel the consequences in three areas: data quality, analytic methods, and hardware and software. Continue reading at ArcUser . . .
Republished from ESRI and GEO Informatics. 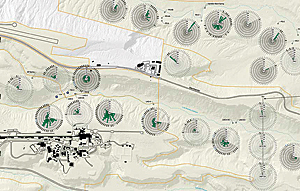 GeoDesign is a set of techniques and enabling technologies for planning built and natural environments in an integrated process, including project conceptualization, analysis, design specification, stakeholder participation and collaboration, design creation, simulation, and evaluation (among other stages). 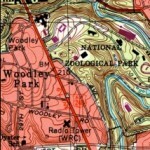 “GeoDesign is a design and planning method which tightly couples the creation of design proposals with impact simulations informed by geographic contexts.”  Nascent geodesign technology extends geographic information systems so that in addition to analyzing existing environments and geodata, users can synthesize new environments and modify geodata. Learn more about GeoDesign on Wikipedia. Read more at ESRI ArcWatch . . .
Read more at GEO Informatics . . .
“It is not so much that geodesign is new, but rather that technology has reached a point that allows artists to participate in the geodesign process – without becoming technologists.” (Kirk at GeoThought) It still requires good (accurate, precise) base maps and themes in GIS to enable smart decision making (geodesign) on the desktop and in the cloud (web apps). Instead GIS techs being puck jockeys, the planning folks will be able to use the GIS directly, or it’ll seem that way to them I used to work somewhere where the boss had desktop design apps installed and he could comp out designs, but they still had to be rebuilt to production specs. My guess is the same will be true with GeoDesign for a good bit yet. Meanwhile, focus on core competencies. 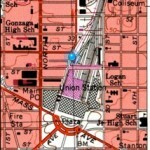 Learn more at the ESRI Developers User Conference later this month . . . This one’s open to everyone. Cash prizes up to $10,000. Due March 5th. Thanks Dan! Create an innovative mashup using ArcGIS Online and Web Mapping APIs for the chance to win one of four cash prizes. Awards will be based on originality, creativity, and analytic process. Build a mashup using ArcGIS Online and ESRI Web Mapping APIs. Shoot a video of your application and post it on YouTube. Read more at ESRI . . .
Scientists working on understanding the integration of space and time will gather in Redlands, California, February 22–23, 2010, to attend the Space-Time Modeling and Analysis Workshop. The workshop will be part of the first Redlands GIS Week—a gathering of thought leaders from academia, government, and industry to advance the science and application of geospatial technologies. The remainder of Redlands GIS Week 2010 will be dedicated to informal networking activities, demonstrations, and technical tours. The Space-Time Modeling and Analysis Workshop will feature keynote presentations, lightning talks, and small group discussions, as well as opportunities for informal brainstorming with leading geospatial thinkers and implementers. 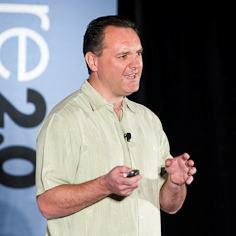 Redlands GIS Week will be held at ESRI’s headquarters, as well as nearby sites in Redlands, California. The event is cosponsored by the Association of American Geographers (AAG), the University of Redlands, the University of Southern California, and ESRI. After the workshop, a publication will share the event’s results with a larger audience. For more information and to view the call for participation, visit www.redlandsgisweek.org. Republished from ArcNews (Winter 2009/2010). GIS professionals are well versed in visualization of spatial relationships and dependencies, of the proximity of near things and distant things, as in things you can measure with a ruler or with mile markers. But often when studying geography and looking for relationships and dependencies, equally important is proximity in time, as in something that can be measured with a watch or calendar. Pioneering environmental planner Ian McHarg is widely known in the GIS community as the “discoverer” of overlay theory, the base theory behind GIS. Another of McHarg’s discoveries—perhaps lesser known, but equally important—is chronology, or the placing of geographic layers in chronological sequence to show relationships, dependencies, and causation through time. 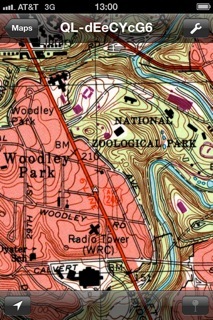 “We found the earliest events, mainly of geological history, had pervasive and influential effects, not only on physiography, soils, and vegetation, but also on the availability of resources,” McHarg states, describing an environmental planning study in the 1960s, in A Quest for Life. He calls his discovery of chronology—the order or sequence of features through time—”. . . a most revelatory instrument for understanding the environment, diagnosing, and prescribing,” a construct that leads to a deeper understanding of structure and meaning in the landscape. Charles Joseph Minard’s 1869 flow map of Napoleon’s 1812 Russian campaign is a classic example of spatiotemporal visualization (Image Source: Wikimedia Commons). Chronology is enabled by temporal data. 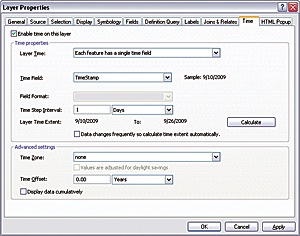 Temporal data is data that specifically refers to times or dates. Temporal data may refer to discrete events, such as lightning strikes; moving objects, such as trains; or repeated observations, such as counts from traffic sensors. Depicting spatial change over time is a four-dimensional problem, and visualizing temporal phenomena on a two-dimensional map has always been a challenge. The simplest approach is the map series, where individual maps of geographic conditions at certain points in time are presented individually, in chronological order. Other inventive methods of visualizing change over time and space include creative symbolization, such as in Charles Joseph Minard’s famous map of Napoleon’s march across Russia. Temporal GIS is an emerging capability for integrating temporal data with location and attribute data, enabling temporal visualization and ultimately temporal analysis. 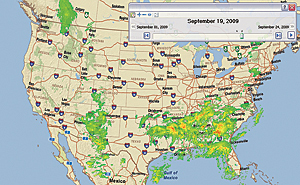 Visualizing change on a computer screen in a GIS environment may give the viewer more options, but it is still a challenge. A simple yet highly effective method of visualizing time in GIS is through animation—displaying a series of maps in rapid succession on the screen. A creative method of representing temporal datasets in GIS developed by the Earth and Environmental Science Division at Los Alamos National Laboratory (ESRI Map Book, Volume 19). “The eye and brain are enormously efficient at detecting patterns and finding anomalies in maps and other visual displays,” says Michael Goodchild of the University of California, Santa Barbara. “GIS works best when the computer and the brain combine forces and when GIS is used to augment human intuition by manipulating and displaying data in ways that reveal things that would otherwise be invisible.” Building a robust temporal capability into GIS provides the human eye and brain with powerful visual tools to help determine the reasons why things happened in space-time. It is also key to modeling and predicting things that might happen in the future. Create and manage time-based data. Display and animate temporal datasets. 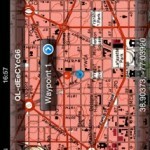 Publish and query temporal map services. 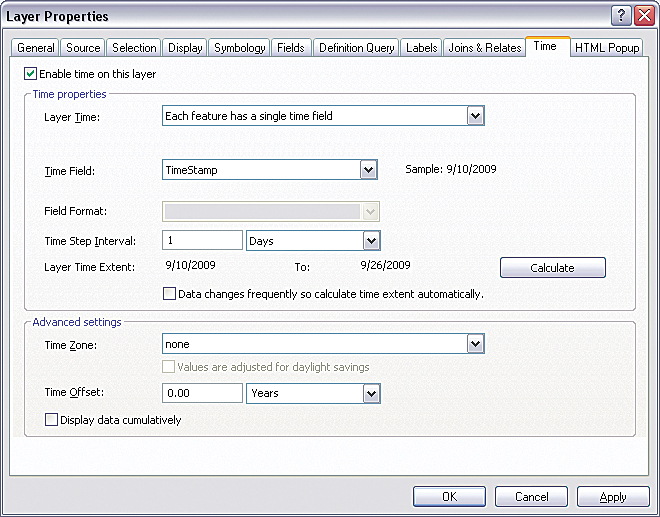 The user interface in ArcGIS 9.4 lets you set time properties for one or more layers. ArcGIS 9.4 makes temporal mapping simple and easy; enables temporal data management, exploration, and visualization; and creates a strong foundation upon which sophisticated temporal geoprocessing tools and workflows can be built in the future. As McHarg states in To Heal the Earth, “Processes, laws, and time reveal the present.” And once we have the tools and techniques in place to fully grasp how the past has created the present, we can use these same tools and techniques to shape our future. For more information, visit www.esri.com/whatscoming.